Our product range includes a wide range of gini and jony - gift card - gift voucher. 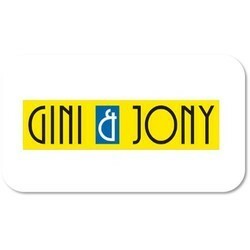 Gini and Jony Gift Voucher: The Perfect Gift of Love to Kids. From infants to teens, from boys to girls, Gini and Jony is the ultimate destination to make a strong fashion statement. Gini and Jony Freedom Fashions are the perfect place for the little ones to be spoiled of choices, offering a wide variety of fashionable clothing and accessories made from high-quality premium fabric to give superior comfort. The renowned retail store presents some of the leading brands such as GJ Baby, GJ Happy Style, Benetton, GJ Jeans Unlimited, Levis, Puma, etc. In addition to apparel, there is an exclusive collection of fashion footwear and accessories to choose from. Looking for Kids - Gift Cards - Gift Vouchers ?